Thanks to Iwata Rumi (facebook friend); she reminds me my childhood school lunch(butter bun, crush bun, cream roll, patties, Danish etc). Hope my little effort to bring back our childhood. Mix yeast, sugar and water together and let it sits for 5 minutes or till you can see air bubble in the mixture. Break the egg and keep 1 tablespoon egg white aside. Mix all ingredients together and knead well till the dough becomes smooth and elastic. 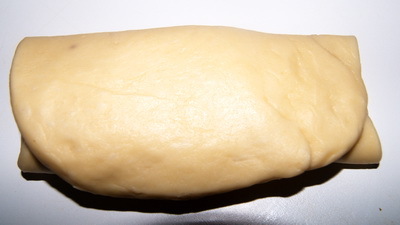 Place the dough in a bowl and cover it. Leave the bowl in a warm place to rise till it becomes double (approx 1hr). Heat the pan with oil and fry the onion till it becomes soft and transparent. Add turmeric and salt and stir it. Add mince and chillies. Cook it till meat is tender. Remove it from heat and keep aside. Knock down the dough then knead it for 2 minutes and divide the dough into 6 balls. 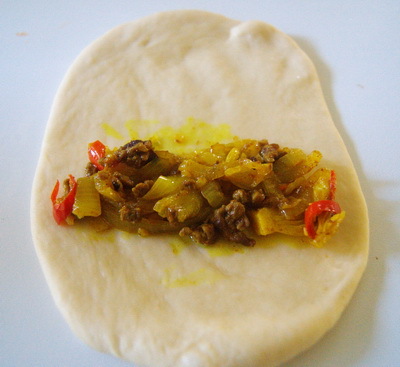 Roll each ball 4″ flat bread and stuff each flat bread and roll it up. Place each bun on a greased baking tray and brush top of the bun with water. Leave the tray in warm to double in size. 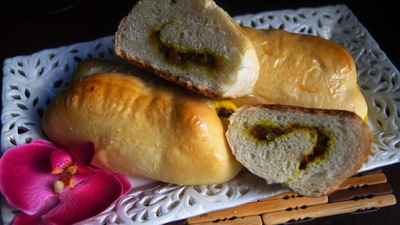 Brush the bun with egg white and bake in preheated oven at 200˚C for 20-25 minutes. Take out from oven and let it cool down. Enjoy the crush bun with sweet childhood memories. apu, 1 cup = koto gram hobe ? thanks. 1 cup koto gram hobe bolo muskil. karon holo 1 cup chini 1 cup flour -er ojon alada . I will suggest to use standard cup measure please. Thanks.